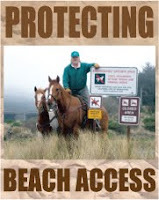 Coastal dunes provide protection and wildlife habitat that many of us enjoy. As the grasses were stripped from our dunes we were told they would be "fragile" and recreation activities would need to be curtailed. The massive vegetation removal efforts have caused significant erosion, de-stabilization and a host of related effects. That has been acknowledged, quietly, by those involved. The problem is, these effects were not a part of the original plan. Oregon and Washington state have completed extensive studies sponsored by the Environmental Protection Agency and the National Oceanic and Atmospheric Administration that warn of the inevitable effects of lowering and de-stabilizing coastal dunes. Problems with projected sea level rise would be compounded. Inexplicably, this legitimate research is largely ignored locally. The coastal development permit written for Friends of the Dunes (FOD) for digging out beachgrasses, was written by county planner Trevor Estlow. Oddly enough, he is a director for FOD and is married to their restoration manager. The de-stabilizing of these dunes also fills established wetlands with smothering windblown sand. The Department of Fish and Wildlife should be very concerned, we thought. Oddly enough its wetland specialist Mike van Hattem, is also a director for FOD, an organization he should be regulating. There is a frequently exposed water main that runs along the Samoa peninsula. It becomes exposed as the bare sand erodes off of the pipe. We provided a well researched presentation to the Humboldt Bay Municipal Water District in April. We showed the de-stabilization and increased erosion caused by removal of the beach grass. One would think they would be concerned, since that pipe provides water to a large part of the county. For instance, each time bulldozers are used to rebury the pipe we all pony up to pay the $11,000 bill. Oddly enough, the chairman of the Water District, Aldaron Laird, is a contributing member to FOD. The Harbor District would be very concerned, we also thought, as that pipe is the key to success on their newly acquired property on the bay. 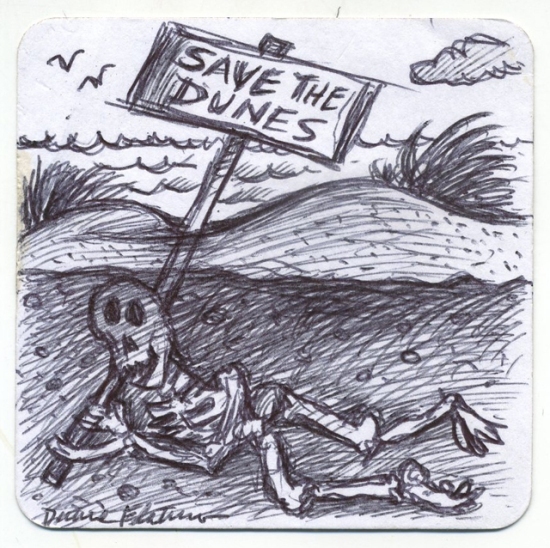 Oddly enough Harbor Commissioner Mike Wilson, is president of FOD, the organization that is still promoting the de-stabilizing of our dunes. Surely we thought, the Coastal Commission would be interested in the information we have found regarding diminished topography, loss of wetland functions and wildlife, threats to infrastructure, expected sea level rise effects, etc. 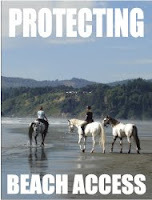 Oddly enough sitting on the board of FOD, you guessed it, is a representative of the Coastal Commission, Tamara Gedik. These agencies generally intently scrutinize much less invasive projects. They seem to be giving these a pass. We have attempted numerous times over the last couple years to engage Humboldt County 3rd District Supervisor Mark Lovelace. The district he represents has many of the effects we are witnessing. Unfortunately he has proven to be more of an obstacle to dialog than a facilitator. We are hopeful, but not holding our breath, that he will help set the table for an honest discussion. I think it is quite fair to say we have moved well past the appearance of a conflict of interest. If the regulators that are hired to protect the public trust are directors and contributors to the very organizations they are supposed to be regulating, what else can we think? I would think that looking into the beavers camping out and backing up the water would be a good place to start investigating the bacteria in Strawberry Creek. On the East Coast there is absolutely no swimming in beaver ponds due to a condition commonly called "beaver fever." Since there is no other real logical explanation I would hope the county looks into that as a possible source of contamination. 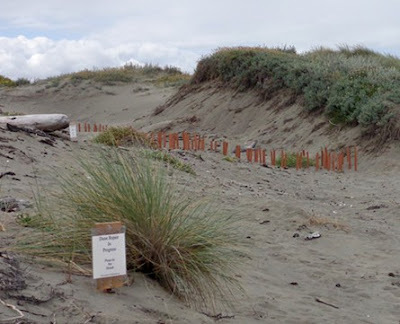 According to Steve Werner, a Humboldt County building and planning supervisor, the district had to either amend its existing permit to include the stakes or else remove them from the beach. Werner said the installation of the stakes was "surprising to see without district authorization." The Manila Community Services District owns the land and already has a permit for dune restoration, but that permit doesn't include the rogue stake experiment, which went in without any official approval. Someone first removed the stakes over the weekend, but no one claimed responsibility. Driscoll and Reel wasted no time re-planting them, adding a sign that read, "Dune repair in progress. Please do not disturb." Coastal Commission District Manager Bob Merrill said his office has contacted the commission's enforcement staff in San Francisco about the issue. While the area is not in a zone where the Coastal Commission issues permits, Merrill wanted to keep the San Francisco office in the loop.... READ THE REST, at the link. of Manila pounds wooden stakes into the sand. Before long they had several dozen of the shims standing upright in the valley between two dunes. The planks looked like tiny frontier grave crucifixes waiting for their crossbeams. Before they left, they shoved more planks into the sand of an adjacent valley. The group was attempting a bit of guerrilla dune restoration, using an unauthorized “bio-mimicry” technique they’d learned about ◼ online. The slats, the men explained, are supposed to mimic dune vegetation by catching wind-blown sand and allowing it to accumulate at their bases. In order to solve rapid erosion problems off the Cape's Atlantic coast Gordon Peabody and his team at Safe Harbor Environmental use Biomimicry, a simple and effective solution. This is a report from Boston Channel 5's Chronicle program. This Saturday morning, a section of Wildberries parking lot (◼ 747 13th Street, Arcata, CA.) will be loaded with sand and local volunteers will be designing a sand sculpture in order to hype the upcoming Sand Sculpture Festival at the Manila Dunes on June 29th! 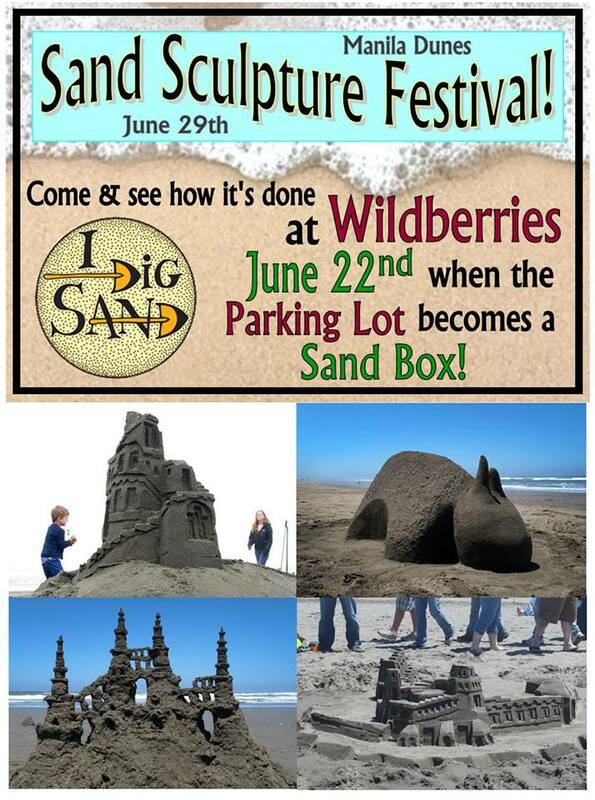 ◼ Wildberries posts A big thank you also to McKenny's Do-It-Best Building Center, Wes Green Landscaping, and Friends of the Dunes for making this happen! Overview: The Lost Coast is an 80 mile stretch of the California coast where the builders of Highway 1 decided to go around because it was too rough. That left this coast all to us backcountry folks as the cars, the people, and the noise keeps a good distance away. This trip takes you down 24 miles of the Lost Coast starting at Mattole and ending at Black Sands Beach.